The compact ThinkRF R5x50 Real-Time Spectrum Analyzer series are designed to monitor wireless signals in real-time rather than via progressive scan as with most common spectrum analyzers. Real-time analysis is essential for observing intermittent or frequency-hopped signals. Sleeker, lighter weight, and quieter than their predecessor models, the R5550 and R5750 analyzers offer improved spectral performance, lower power consumption, and improved portability at a more cost-effective price over the previous R5500 models. The R5750 version adds an embedded GPS capability for time and location data, and comes with an optional IP66 rating for increased durability and ruggedness in challenging environments. Both are built for outdoor, mobile, and distributed deployment scenarios. The portable, fanless ThinkRF R5x50 comes in 8, 18, or 27-GHz versions. 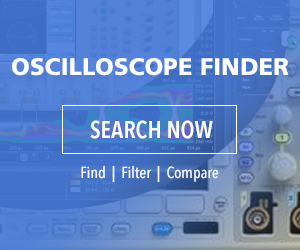 They offer all the standard features of a sophisticated, expensive bench-top spectrum analyzer, but at far lower cost since they employ the display and processing power of an attached PC. Frequency controls, marker functions for tracking specific frequencies and multi-trace functionality are all included, as well as a real-time triggering for measuring complex data signals such as Wi-Fi and LTE. Sophisticated FPGA-based digital signal processing within the R5x50 enables the capture of elusive time-varying signals across an instantaneous bandwidth of up to 100 MHz. Real-time spectrum analyzers excel at sensing signals that vary dynamically in amplitude or are agile in frequency, such as pulsed radar systems, frequency-hopping spread spectrum radios, and pulse modulated radios, multi-signal environments, or unwanted signals such as unintentional self-interference, intentional interference (jammers), and listening devices (bugs). Made by ThinkRF, a leading Canadian manufacturer of precision electronic instrumentation for test, measurement, and research, R5x50 Real-time Spectrum Analyzers are available now from Saelig Company, Inc. the USA technical distributor. For detailed specifications, free technical assistance, or additional information, please contact Saelig 888-7SAELIG, via email: info@saelig.com, or visit www.saelig.com.